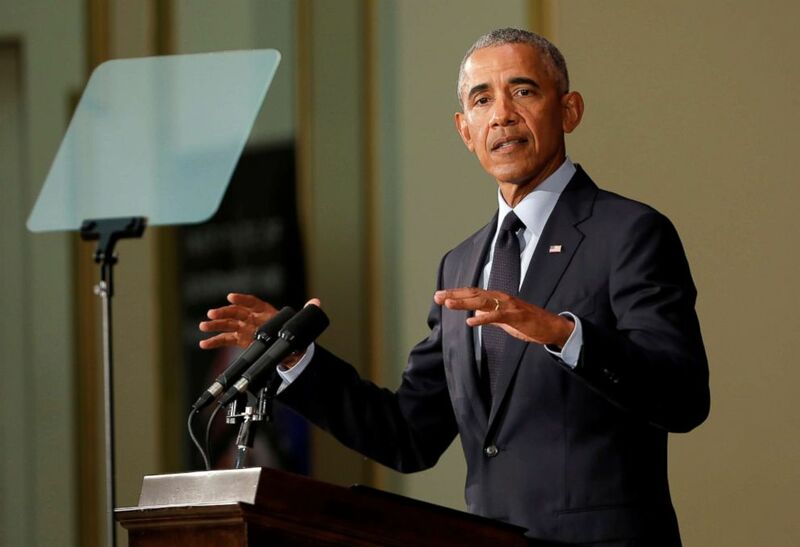 In an urgent and defining speech Friday, former President Barack Obama set himself up as a heavyweight counterpoint on the campaign trail to President Donald Trump -- as both men make plans to vigorously support their party’s candidates in the final two months of the midterm elections. “As a fellow citizen, not as a former president, but as a fellow citizen I am here to deliver a simple message. You need to vote because our democracy depends on it,” Obama said. Former President Barack Obama speaks at the University of Illinois Urbana-Champaign in Urbana, Ill., Sept. 7, 2018. "Now, some of you may think I'm exaggerating when I say this November's elections are more important than any I can remember in my lifetime," he told the crowd. "I know politicians say that all the time. I have been guilty of saying it a few times, particularly when I was on the ballot." "But just a glance at recent headlines should tell you that this moment really is different. The stakes really are higher. The consequences of any of us sitting on the sidelines are more dire." Obama acknowledged that he kept his head down after he left office, saying that it's typically tradition for a president to exit the political stage and make room for a new generation of politicians. In 2017 he said he wanted to keep it quiet "and not hear myself talk so darn much," but emphasized that he's still a citizen and would be paying attention. Now Obama is sharing what he thinks about the Trump administration and the state of American politics publicly. In his Friday speech he addressed Republican proposed tax cuts, the economy, the failure to condemn white nationalists after the rally in Charlottesville and even the perceived disarray at the White House after an anonymous administration official said they were working to save the country from President Trump's worst impulses. Obama was on hand to receive an award for ethics in government from the University of Illinois as he sets out to begin campaigning for Democrats in the 2018 midterm elections. 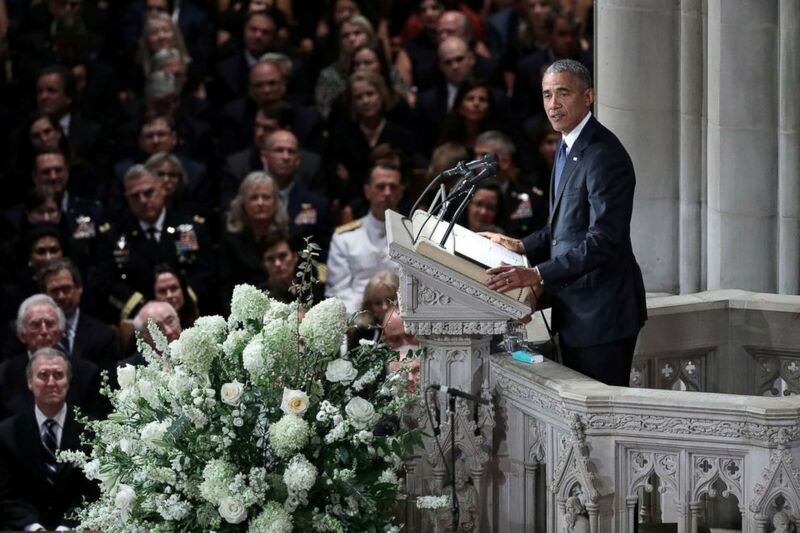 The former president assailed what he described as the denigration of American ideals, and urged Americans to reject the forces that "keep us divided and keep us angry." "Our ideals that say we have a collective responsibility to care for the sick and the infirm," he said. "And we have a responsibility to conserve the amazing bounty, the natural resources of this country, and of this planet for future generations." "Each time we have gotten closer to those ideals, somebody somewhere has pushed back. The status quo pushes back." Obama took the rare step of calling out Trump by name, saying that the threat to democracy ultimately isn’t from Trump or Republicans, but from indifference or cynicism that voting doesn’t make a difference. Obama went on to call out the “politics of fear and resentment” that he said has consumed Republicans. You happen to be coming of age during one of those moments. It did not start with Donald Trump. He is a symptom, not the cause. He just capitalizes on resentments that politicians have been fanning for years. Obama asserted that the Republican Party has abandoned its principles of fiscal conservatism, “cozying up to the former head of the KGB,” and has made America the only country to pull out of a global climate agreement. "They made it so that the only nation on Earth to pull out of the global climate agreement -- it's not North Korea, it's not Syria, it's not Russia or Saudi Arabia, it's us." "The only country -- there are a lot of countries in the world. We're the only ones." Obama said in a “healthy democracy” there are checks and balances against this inconsistency but that the country has lost that under the current leadership. As a fellow citizen, not as a former president, but as a fellow citizen I am here to deliver a simple message. You need to vote because our democracy depends on it. In a rare comment on a specific news story Obama also referenced an anonymous op-ed by a “senior administration official” calling themselves the resistance within the administration. In two months we have the chance to restore some semblance of sanity to our politics. "The claim that everything will turn out O.K. because there are people inside the White House who secretly aren’t following the president’s orders, this is not a check” on the president's power, Obama said. “I’m serious here." "They’re not doing us a service by actively promoting 90 percent of the crazy stuff coming out of this White House and then saying don’t worry we’re preventing the other 10 percent." But he said the good news is the midterms are just two months away. “In two months we have the chance to restore some semblance of sanity to our politics,” he said. Obama's speech was a reminder of his different style than Trump, who said Friday that he watched the speech "but I fell asleep." At a rally in Montana on Thursday night, Trump called Democrats' attempts to delay Brett Kavanaugh’s Supreme Court confirmation “sick” and seemed to praise a Republican congressman who was charged with assaulting a reporter during the campaign. Trump appeared to be saying that the future of his presidency could depend on the results of the midterm elections, referencing a few Democrats who have called for him to be impeached if their party takes the majority in the House. “If it does happen, it's your fault, because you didn't go out to vote,” Trump told the audience at a rally. Earlier this week Obama announced that he would campaign for candidates in California and Ohio in the coming weeks. Michelle Obama is also scheduled to hold several rallies encouraging Democrats and young people to vote. Obama is the 28th person to receive the Paul H. Douglas Award for Ethics in Government, which has also been given to the late Sen. John McCain, civil rights leader Rep. John Lewis and Supreme Court Justices Sandra Day O’Connor and John Paul Stevens. The award is named for Senator Paul H. Douglas, who represented Illinois from 1949 to 1967, according to the school's website.